For better or worse, I’m not always a very good representation of a twenty-something year old girl. 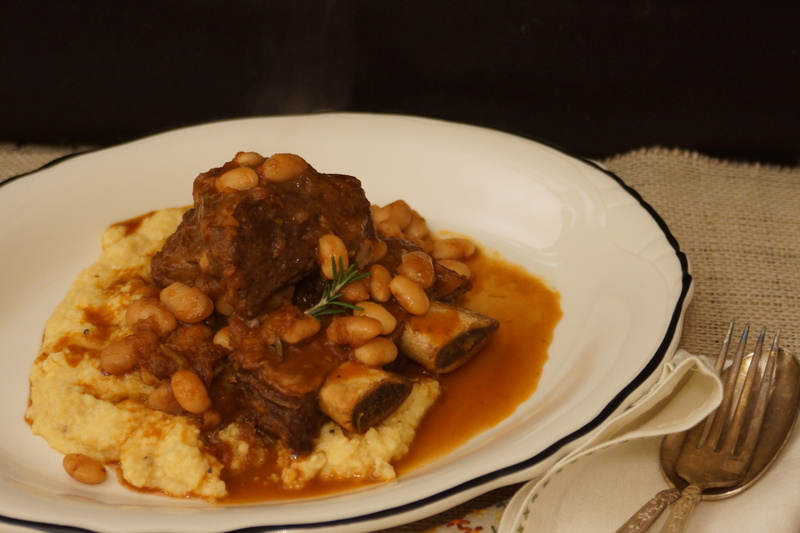 Example: Instead of going out on the town and cutting loose this past Saturday night, I found myself at home, dressed for comfort, braising beef short ribs and cannellini beans. Sounds more like an activity for your eighty year old nonna than this vibrant young woman. And did I mention I sat around drinking tea and flipping through cookbooks while I waited for my dinner? Oh, well, it’s hip to be square these days, right? 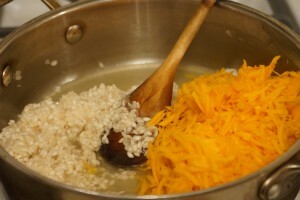 Butternut squash risotto. Hardly a new idea, I know. You’ve probably been seeing it on restaurant menus every fall and winter for decades. 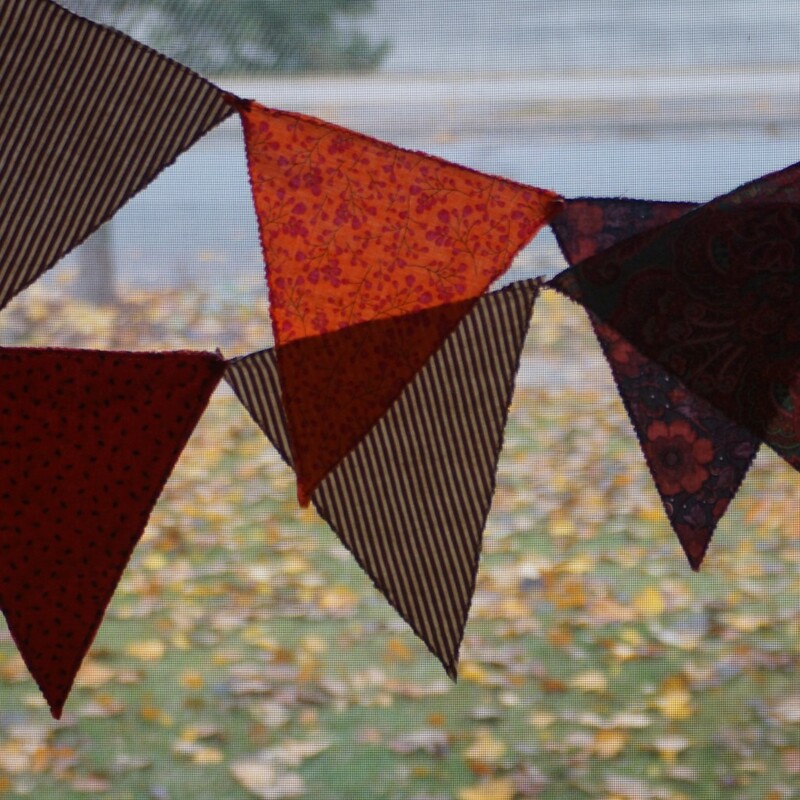 You probably already have your own way of making it at home. 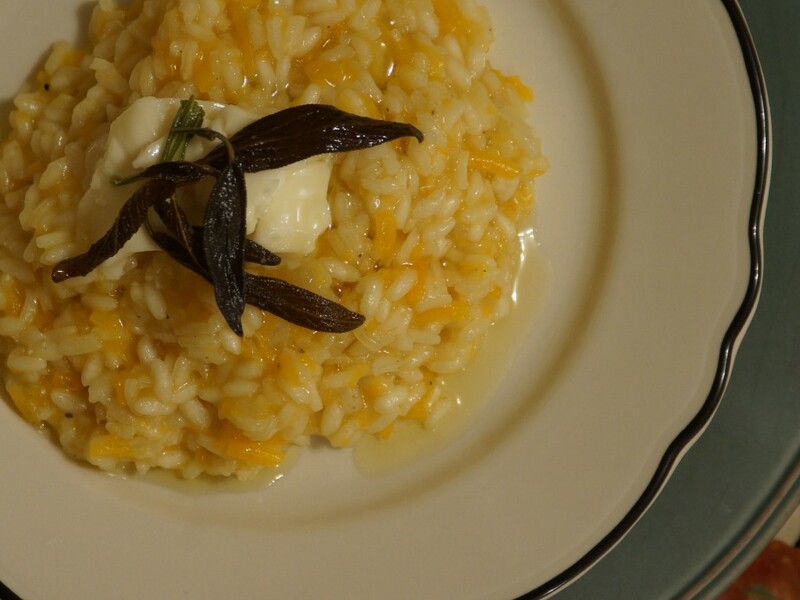 Why should you bother reading about this risotto rendition? I’ll tell you why. Because tonight you are going to bypass the Gorgonzola Dolce that you’d usually put on top and opt for a super stinky, creamy Taleggio instead. You’ll grate the squash and let it get as silky and creamy as the rice. You’ll go ahead and take the extra thirty seconds it takes to fry a couple of sage leaves to add a little contrast, a bit of crunch. 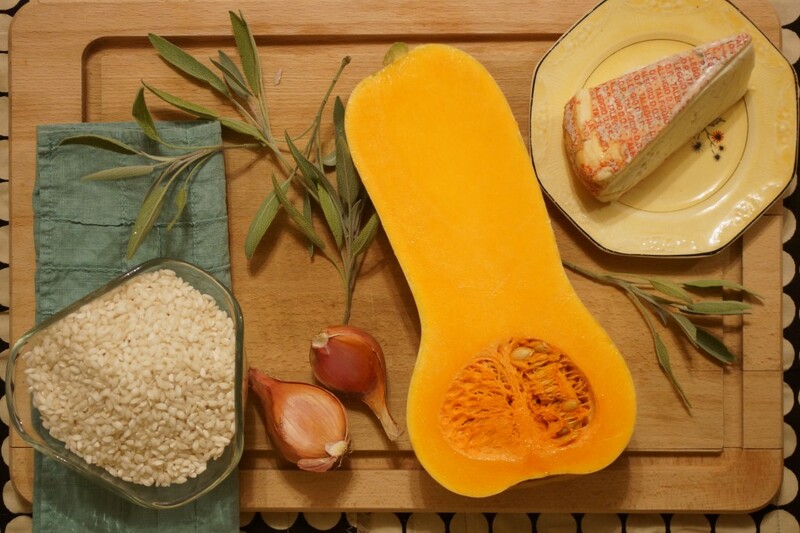 Then you’ll sit back and realize there will always be room in your heart (and tummy) for another bowl of butternut squash risotto. 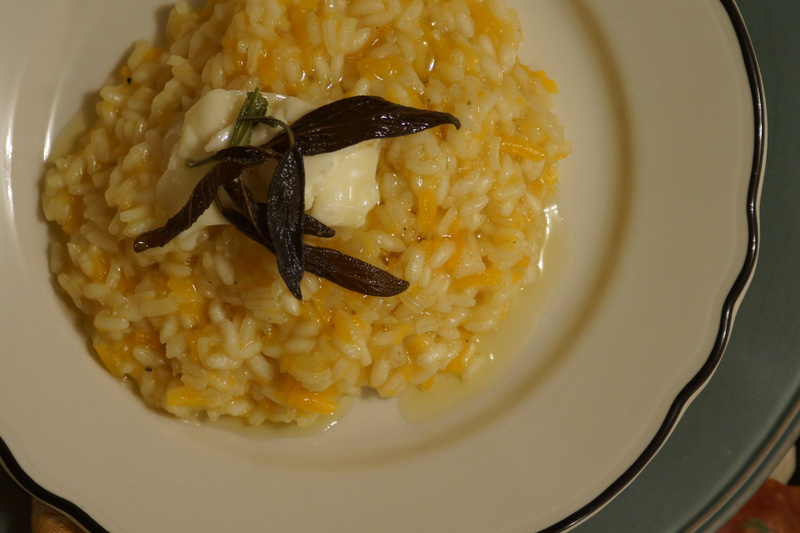 Just a few ingredients: rice, shallots, sage, cheese. You’ll also need wine, broth, butter, and oil, but they’re a little camera-shy. Prepping is super easy. 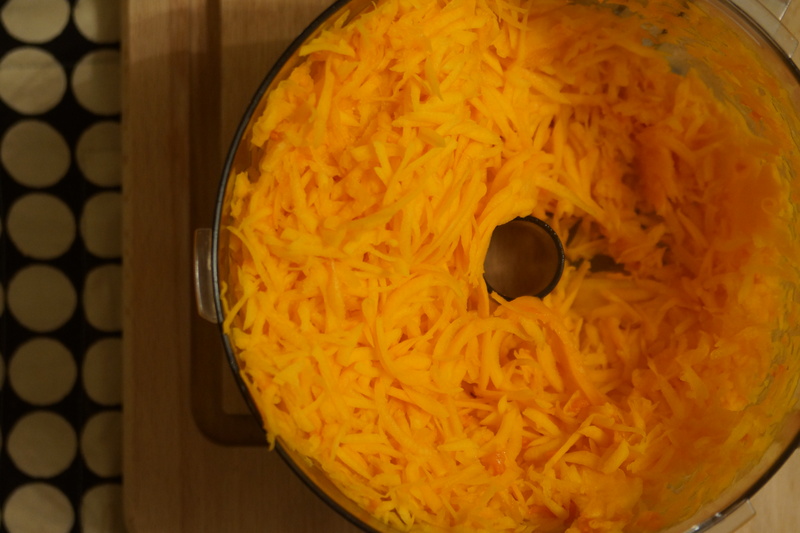 Just shred the squash, dice the shallot, and you are ready for pan-action. You probably know the drill- heat some oil and butter, saute your shallot, add some arborio rice, get a little toasty. 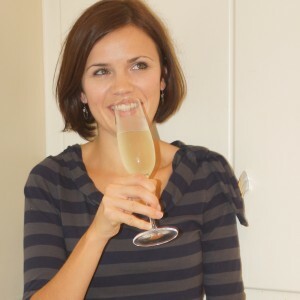 A splash of white wine for the pan, a splash for the cook. 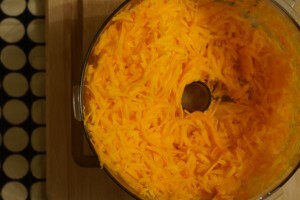 In goes the squash, slowly add broth. Don’t rush it, don’t ignore it too long. It’ll be worth the trouble, I swear. Heat a touch of oil and fry your sage leaves until they are crispy and fragrant. Look at you, fancy pants! 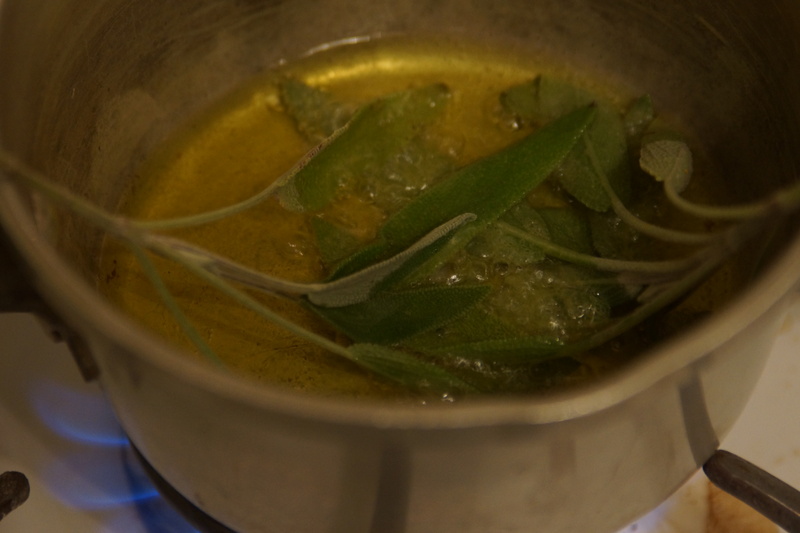 Now you have two garnishes for your dinner: fried sage leaves and an infused sage oil to drizzle over the top. Put it all together. 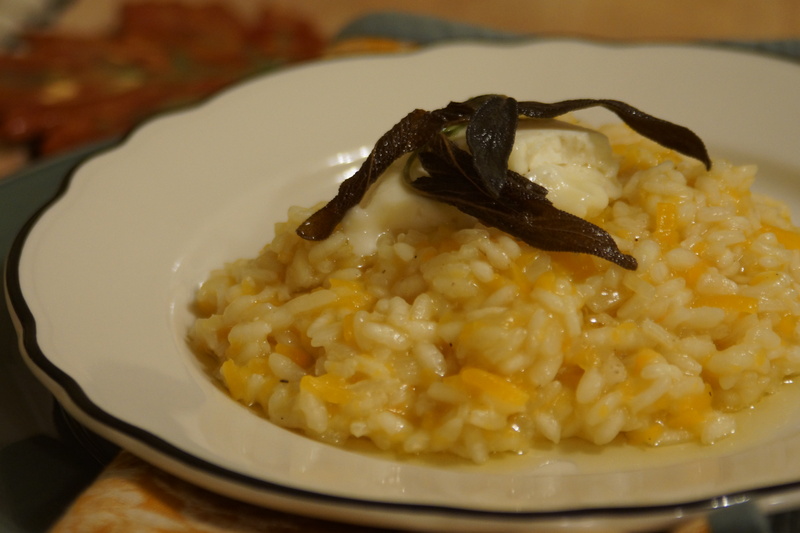 Risotto, spoonful (or two) of melty Taleggio, crispy sage leaves, a touch of herb oil. Yeah, that’s right. It’s good. Real good. Serves 4 as a main course, 6 as a first course. Leftover risotto can be formed into a cakes or croquettes for a delicious lunch. Heat 1 Tbsp.olive oil and 1 Tbsp. butter in wide sauce pan over medium heat. 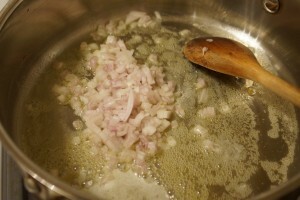 Add minced shallots, season with salt, and saute until translucent. Add rice and saute until it takes on a little golden color and makes a "click" sound as you stir it around the pan, about 1 minute. 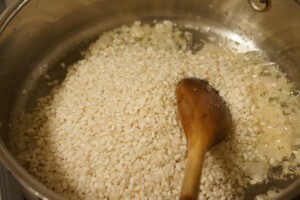 Add wine and allow rice to absorb. 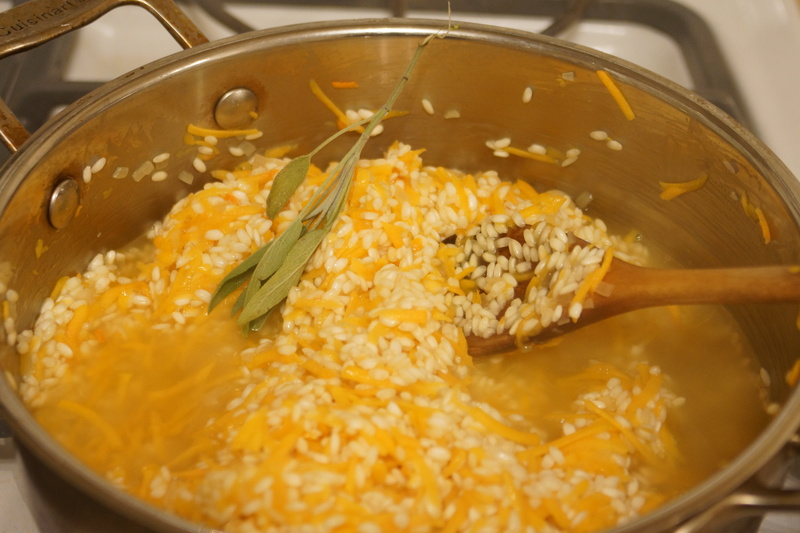 Reduce heat to medium-low and add 1 c. of the hot broth, grated squash, and a sprig of sage. 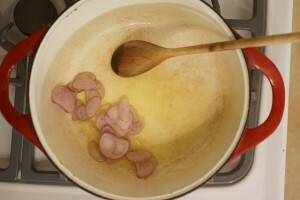 Cook over medium-low heat, about 45 minutes, stirring often and adding more broth as the pan becomes dry. Taste and season as necessary with salt and coarse black pepper. The risotto is done when the rice is cooked to a creamy consistency but still has a little firmness in the very center of the grain. Meanwhile, heat remaining olive oil in small sauce pan and fry sage leaves until crisp and fragrant. Removes leaves and sprinkle with salt, reserve oil. 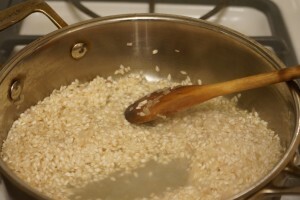 Divide risotto among warm plates. Top each portion with a spoonful of Taleggio and a couple fried sage leaves. Drizzle with reserved sage oil. I hesitate to post a salad like this because it is more a list of ingredients than an actual recipe, but I’m going to anyway because it is just that tasty. Plus, if you’ve been looking for a reason to buy a mandoline, this salad is the perfect excuse. This simple salad is as welcome on your table as an easy weeknight dinner with a simple piece of fish or chicken breast as it is a side or starter when entertaining. 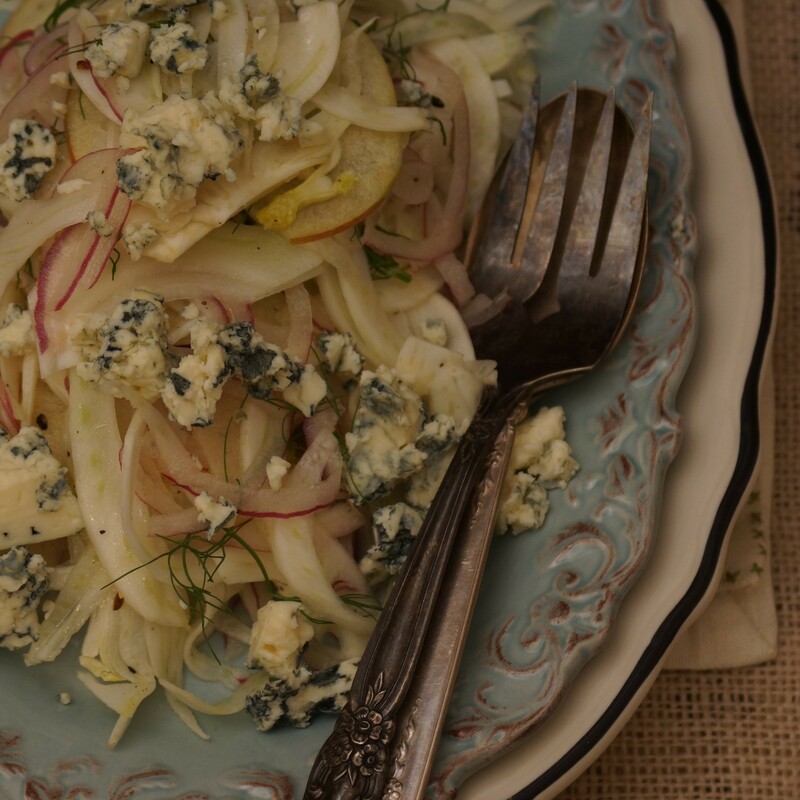 Recently, I served this raw fennel slaw after a dinner of braised short ribs. It was perfect as a crisp refreshing end to a somewhat heavy (but super delicious) meal. It’s like having a salad, cheese course, and dessert all on one plate. Let’s put it together. 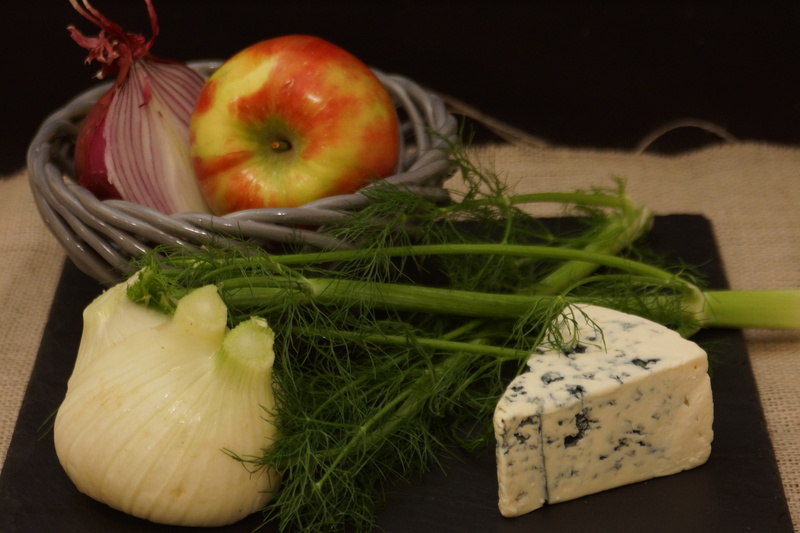 Four proud ingredients: Fennel, Apple, Red Onion, Buttermilk Blue Cheese. There’s nothing to making this salad. 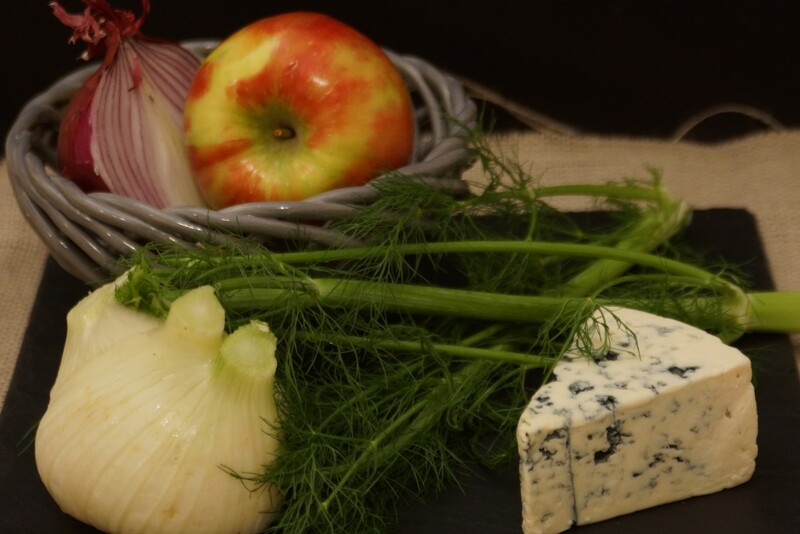 We’re just going to shave the apple, fennel, and onion. You can use a knife, a box grater, or a mandoline. It only took me five minutes to prep the ingredients with my handy mandy. Best gift, ever! 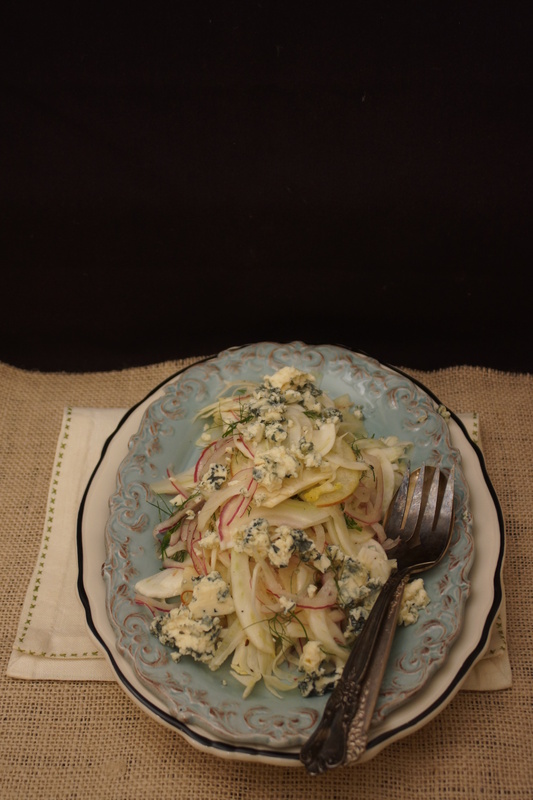 Throw your shaved vegetables in a big bowl, season them up, toss with wispy fennel fronds. Transfer to pretty serving plate, mound it up nicely, and sprinkle with blue cheese. That’s it. Five minutes. Simple and tasty. Pretty, crisp and flavorful. You’re done. You’re amazing. This salad is great with a simple fillet of salmon or chicken breast for a light dinner or wonderful as a refreshing side with a heavier main course. 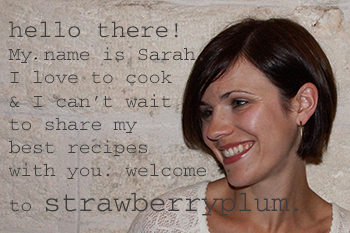 All ingredient amounts are approximate, add and subtract to suit your taste. 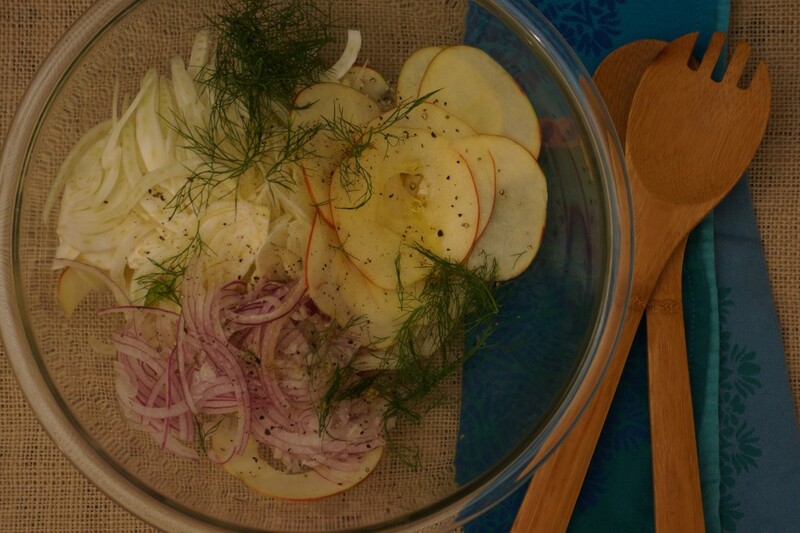 Shave fennel, onion, and apple on mandoline. 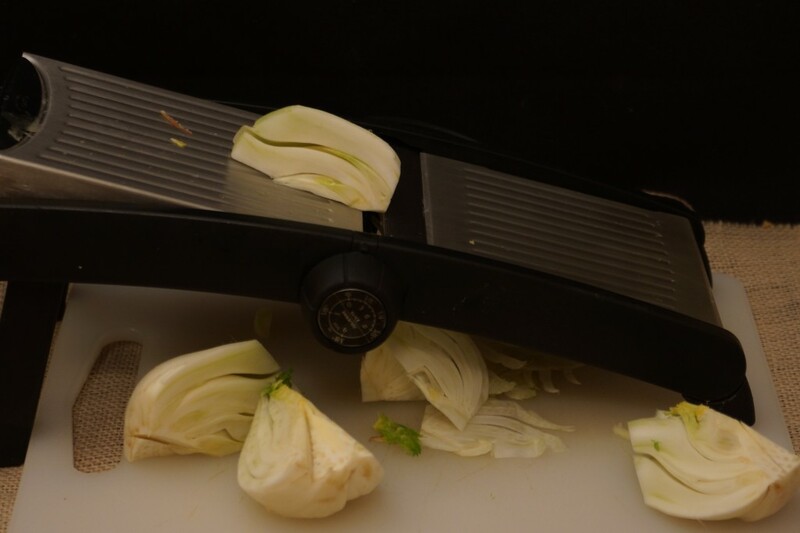 If you don't have a mandoline, just slice ingredients as thin as you can. Sprinkle apples with lemon juice to prevent discoloration. 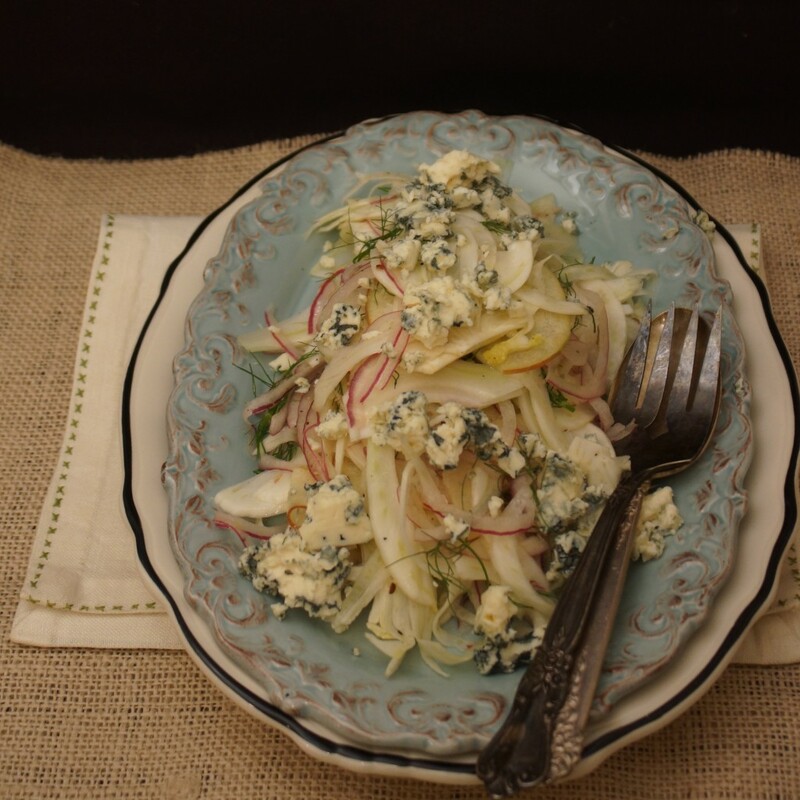 Toss shaved vegetables and apples in large bowl, along with the feathery greens from the top of the fennel. Season with salt and pepper, dress with olive oil and vinegar. Transfer to a serving plate and top with crumbled blue cheese. I have a confession. Actually, it’s more of an admission; it’s not something I feel particularly bad about. I judge books by their covers. It’s not because I’m shallow, or (just) because I like pretty things, it’s because I think if a lot of care was given to the content of a book, the author will want the same level of attention paid to the outside. Sometimes this works out really well for me and I discover a great read I may not have otherwise found. Other times I end up with books, well-written or not, on a subject I have zero interest in. So what does this have to do with anything? Well, it seems I apply these same principles when buying beer and on occasion I end up with a beautifully labeled six-pack containing sour-mash ale that, while I’m sure it was masterfully brewed, I have little desire to drink. Have you ever had a sour-mash ale? This was my first. 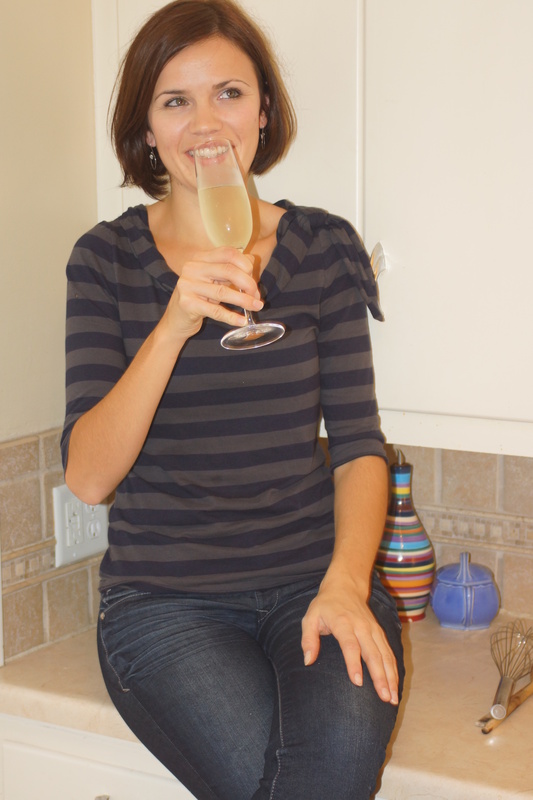 It tasted, to me, like equal parts puckery Sauvignon Blanc, crisp lager, and tart lemon juice. I didn’t want to drink it, but I certainly didn’t want it all to go to waste either. So what do you do when life hands you really lemony beer? It turned out to be a brilliant solution. 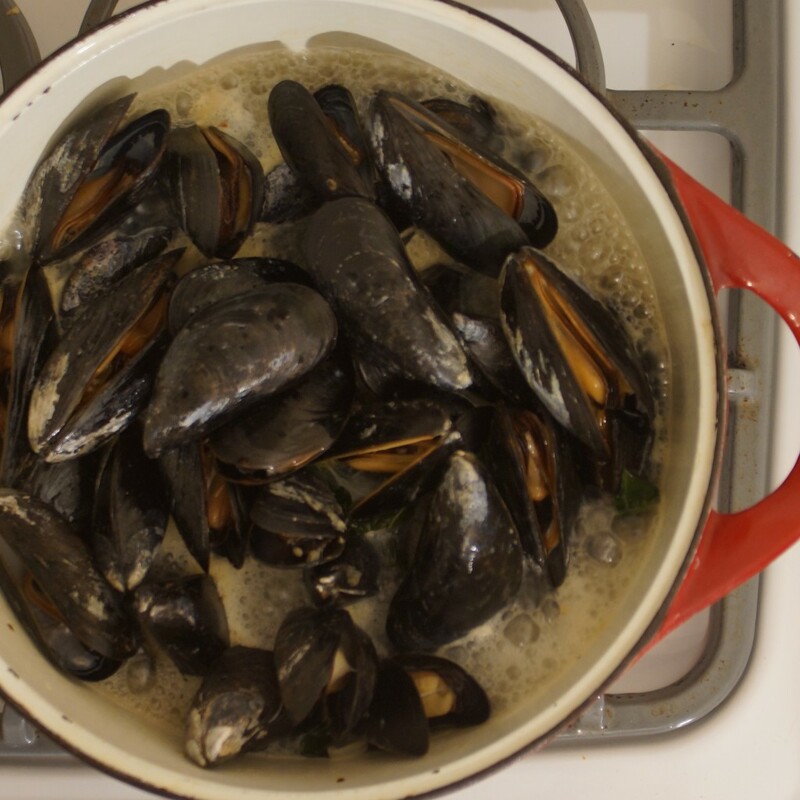 I love mussels steamed in beer or white wine with a squeeze of lemon. This is the perfect mussel steaming liquid, neatly contained in one (beautiful) bottle. I’m going to toss some kale in to steam with my mussels so I can call it a complete meal. 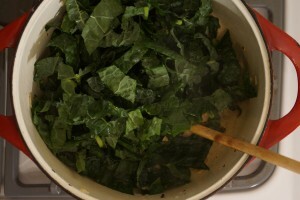 Plus the kale will look charmingly like seaweed when the dish is complete. Saute some shallots, plenty of garlic, pinches of red pepper flakes. 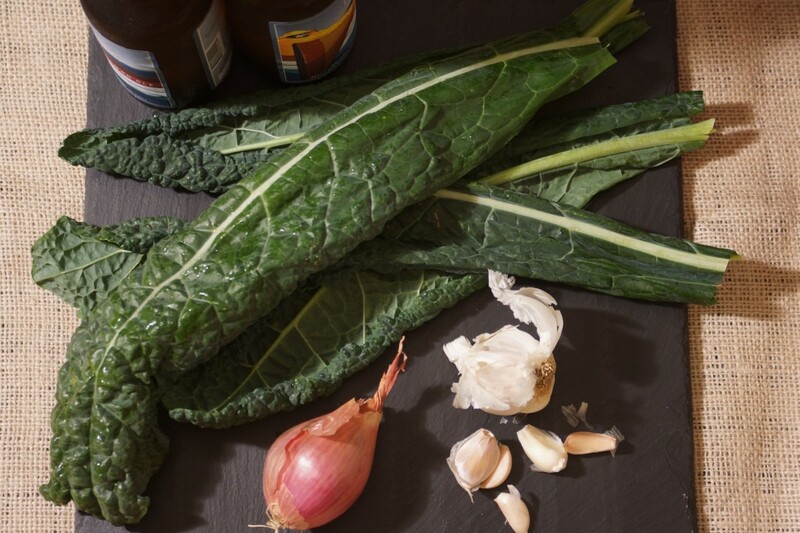 Add kale, let it work up a thirst, and buy it a beer. 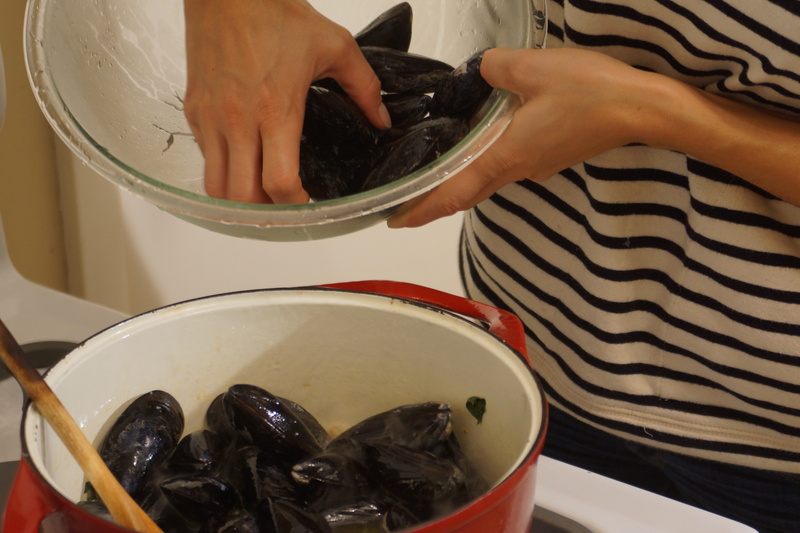 When it gets nice and steamy, it’s time to add your mussels. Yes, I wear a lot of stripes. Steam until the shells pop open. Toast thick slices of baguette, rub with garlic, drizzle with oil. Set the table with plenty of napkins, a discard bowl for the shells, and a tower of after-dinner mints. I used sour-mash ale simply because I had on hand. 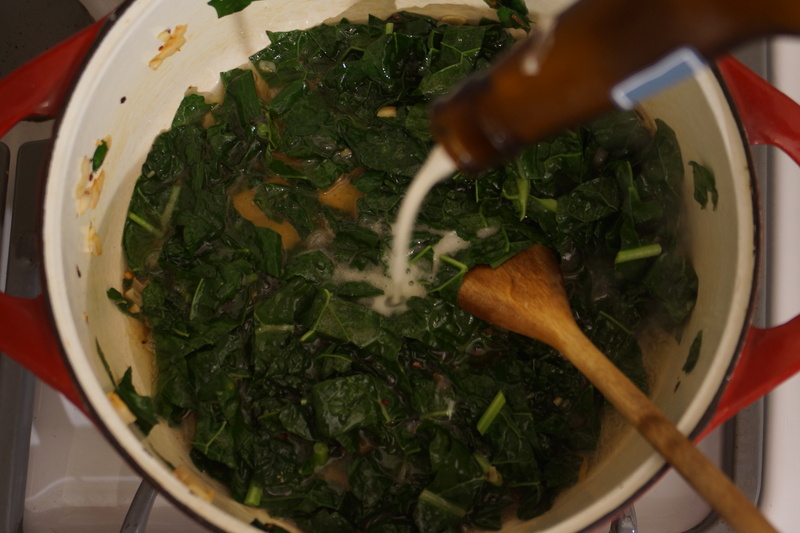 You could use white wine or any beer and a little lemon juice. 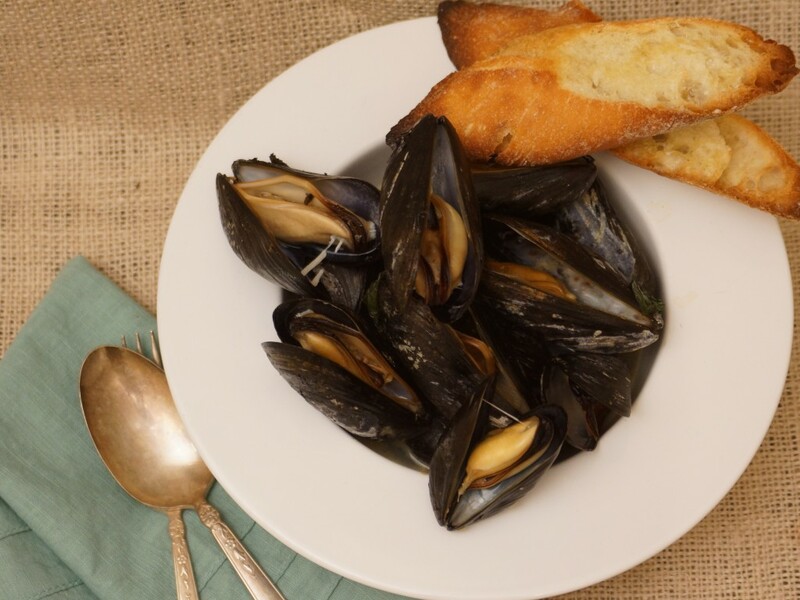 I added kale to make this a complete meal but feel free to leave it out if you are serving these mussels as a starter or with a salad on the side. Heat 2 Tbsp. olive oil in heavy-bottomed pot over medium-high heat. Add shallot, saute briefly. 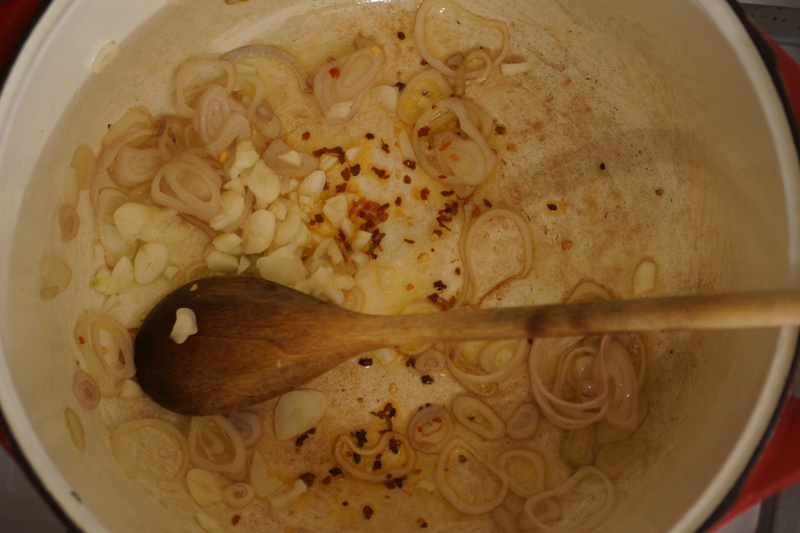 Add garlic and red pepper flakes, allow to become golden but do not burn. Add kale, if desired,season with salt, and allow to wilt slightly. Add beer and bring to boil. 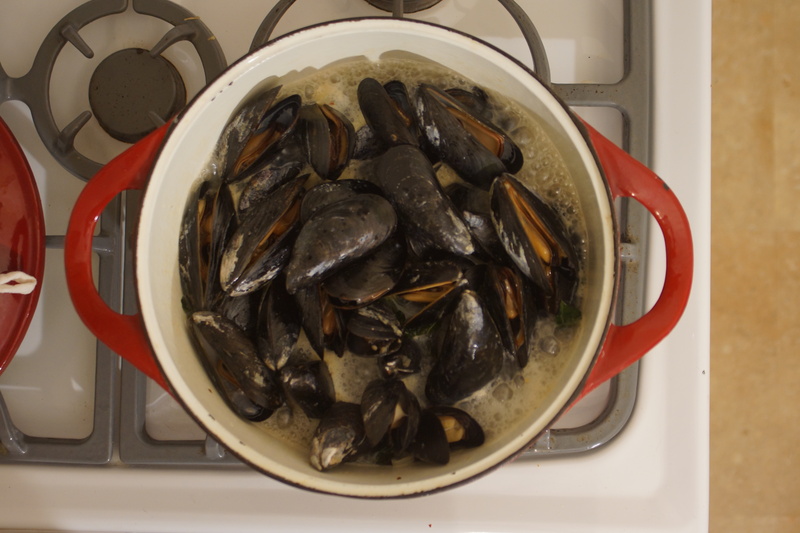 Gently (you don't want to break any shells) add mussels to pot, cover, and allow to steam until shells open, about 5 minutes. Meanwhile, rub toasted baguette with raw garlic and drizzle with oil. Serve mussels in warm bowls or straight from the pot with plenty of the toasted bread to soak up the steaming liquid.